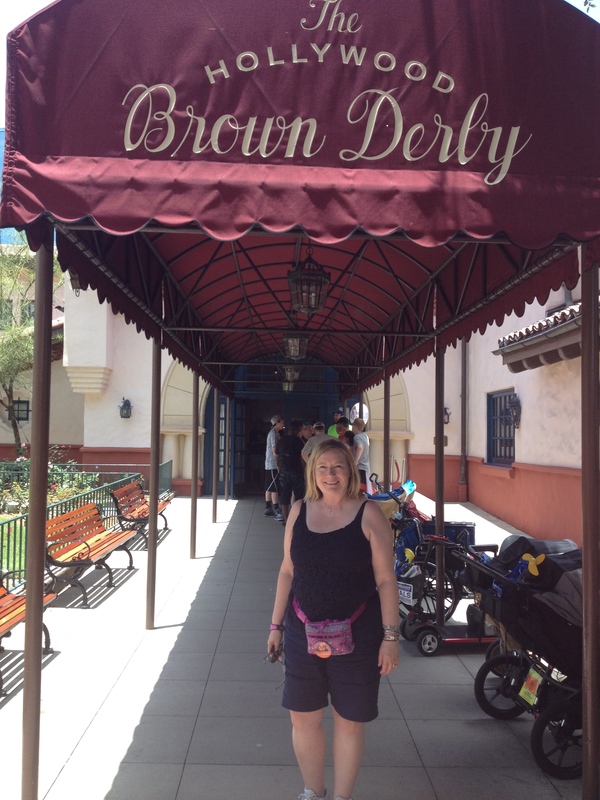 Annette’s Big Family Vacation Scrapbook: from the Happiest Place in the World, Walt Disney World! | I'm Annette! 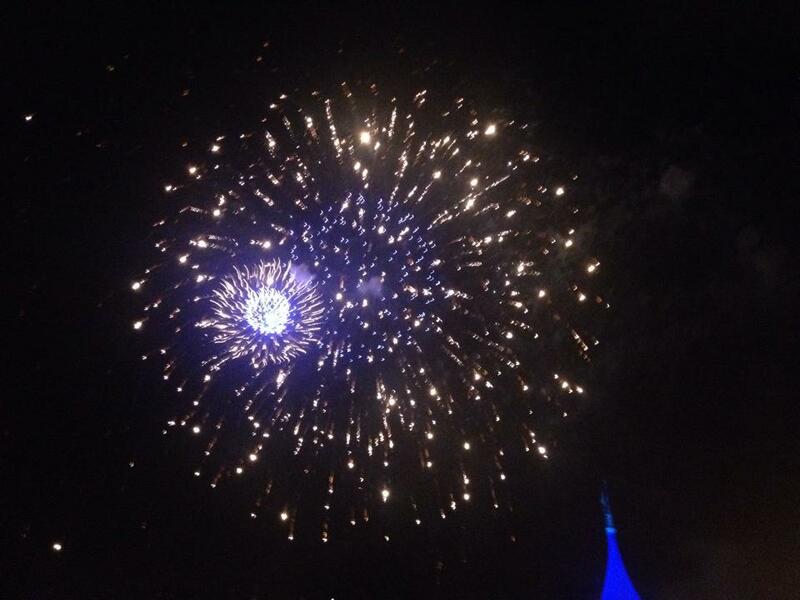 Happiest Place in the World, Walt Disney World! (Note my Disney magic wristband, a new Disney innovation making fast passes/going to the head of attraction rides even easier to use. Let me begin with the obvious. 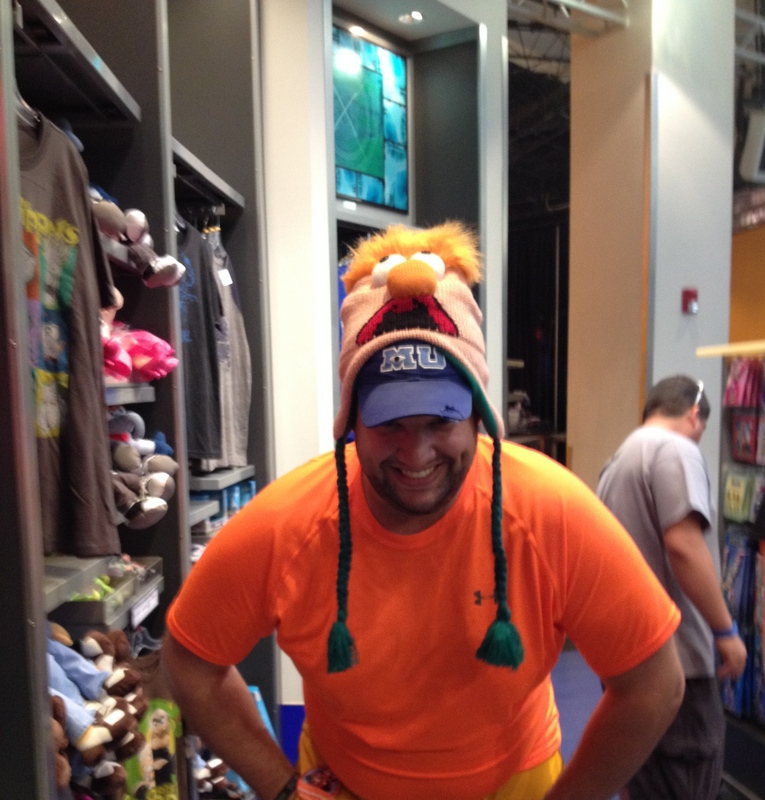 Walt Disney World is fun! 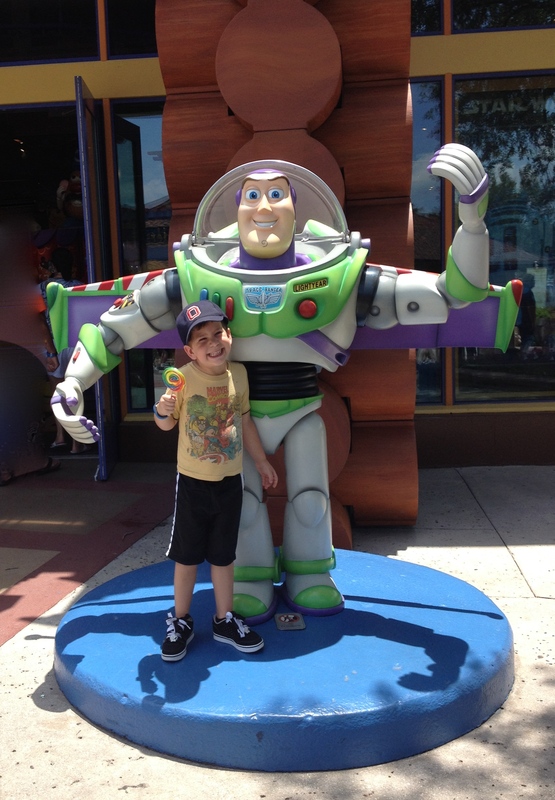 Encompassing four Disney theme parks, each one offers a little something for everyone from fantasy to thrills. 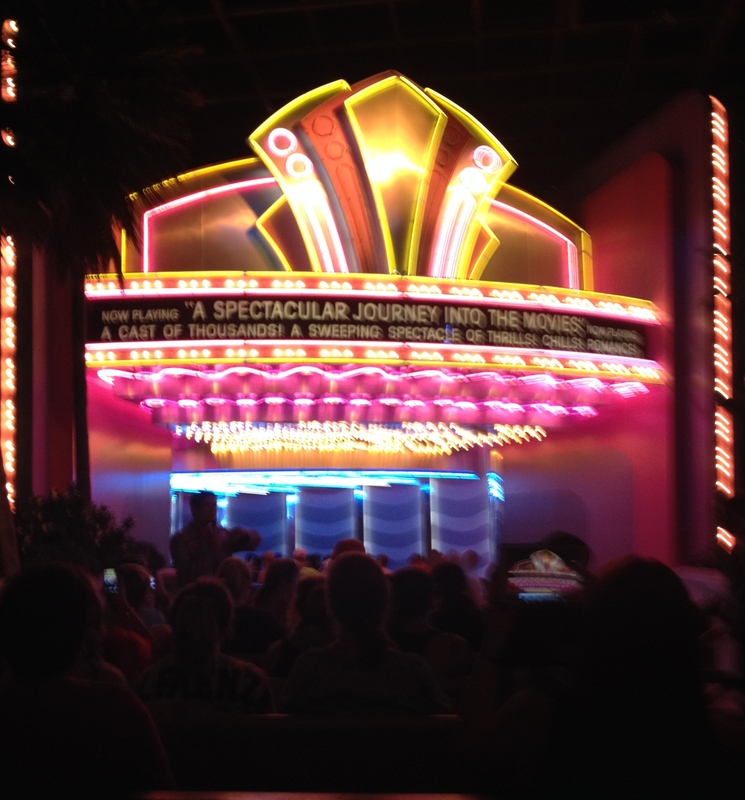 In the interest of time and space, I will focus mostly on one particular ride, my very most favorite: The Great Movie Ride. 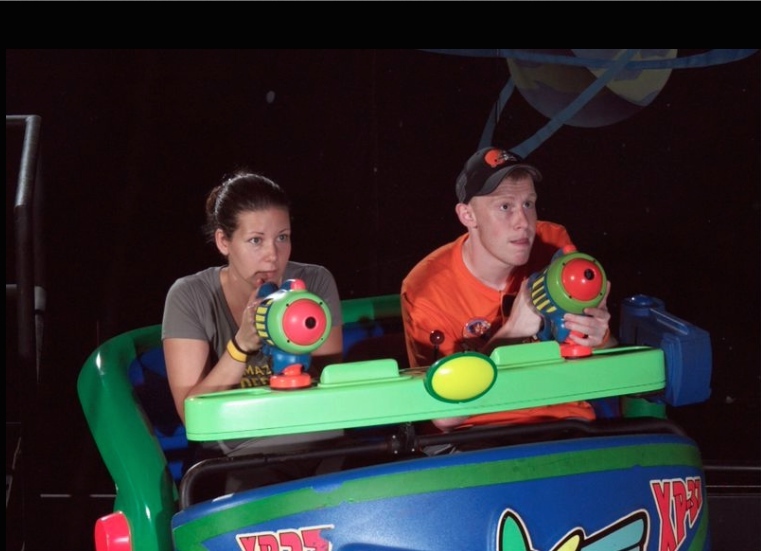 This great ride is located in Hollywood Studios, which was at one time known as Disney-MGM Studios. Being an old movie buff (no I am NOT old, the old pertains to the movies), this ride feels as if it was made with yours truly in mind. 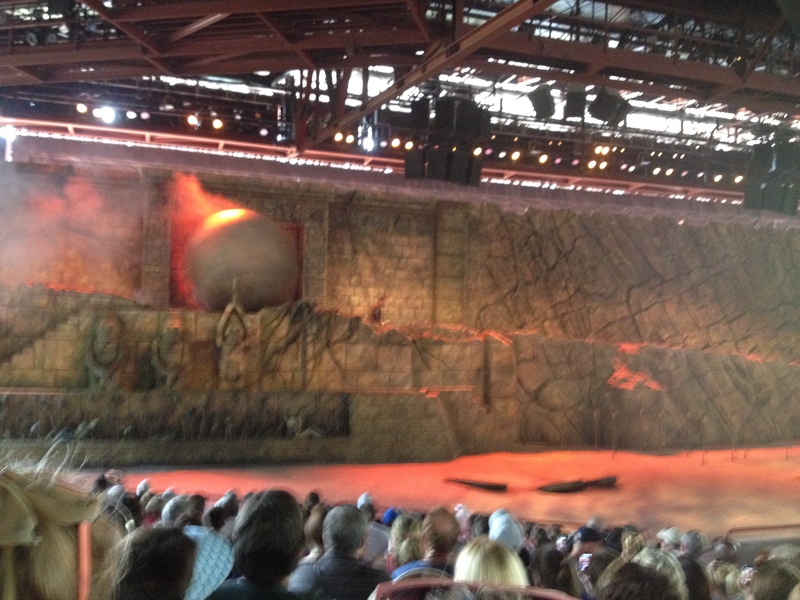 In fact, my enthusiasm for this attraction is so intense that I dream of one day having the honor, as a temporary cast member, of hosting/narrating just one tour on this awesome ride. How fun would that be? I love this ride! 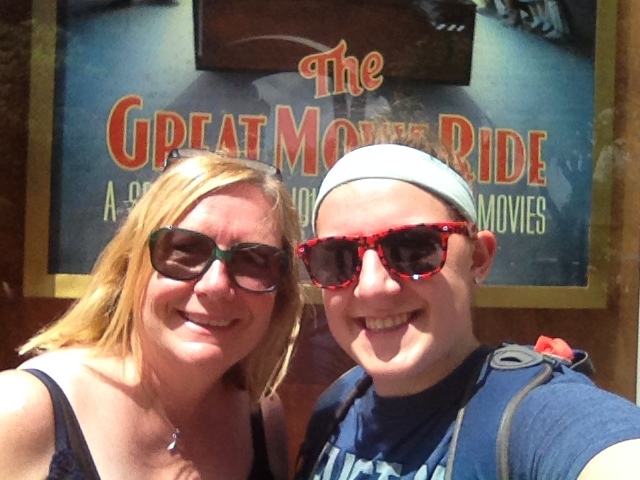 who did a nine month WDW internship in Hollywood Studios while attending college, and me, in front of The Great Movie Ride. in the courtyard of The Great Movie Ride. Movie props line the inside entrance into The Great Movie Ride. The figures are so lifelike that Ingrid Bergman’s grandchildren came on this ride to “see” their grandmother. 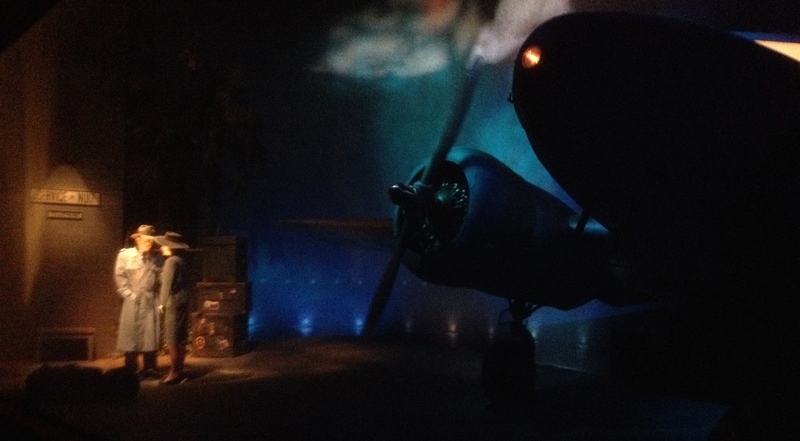 For more Great Movie Ride Trivia and information, please click on these links. 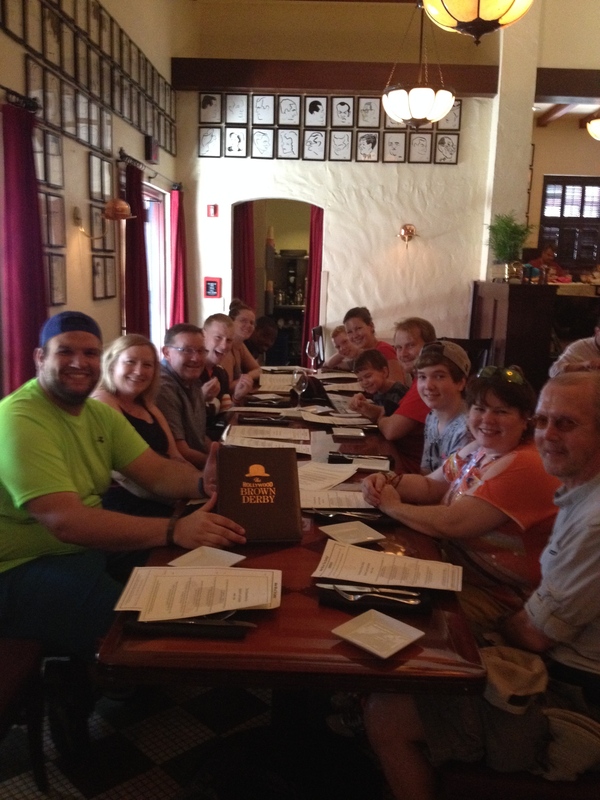 Walt Disney World presents its patrons, and in particular, foodies (I, myself, am a self professed foodie. 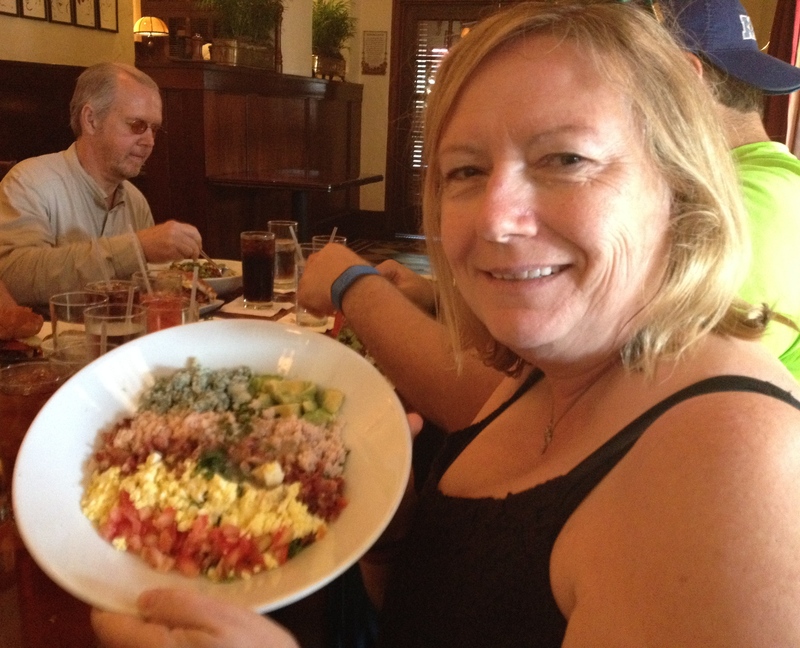 ), with a variety of culinary options to please the palate. 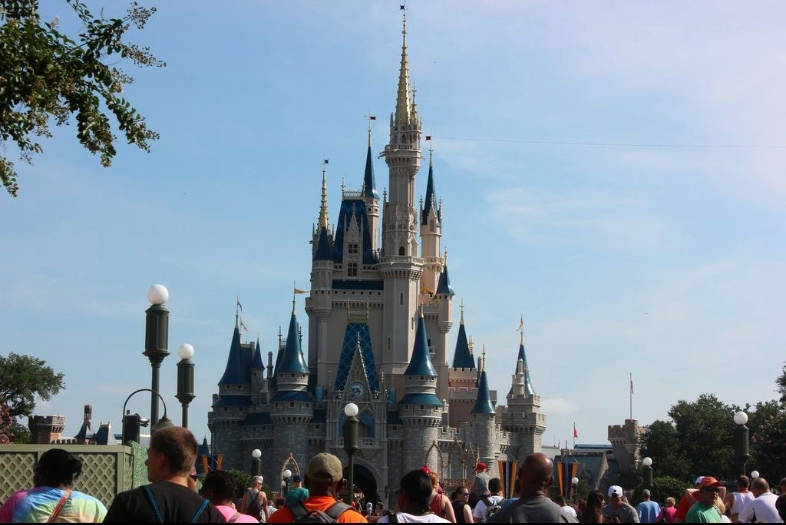 Options range from the simple, yet delightful, Mickey Bars, Pineapple Dole Whips and turkey legs, to fine dining at the hotel resorts, and the park’s finer restaurants. 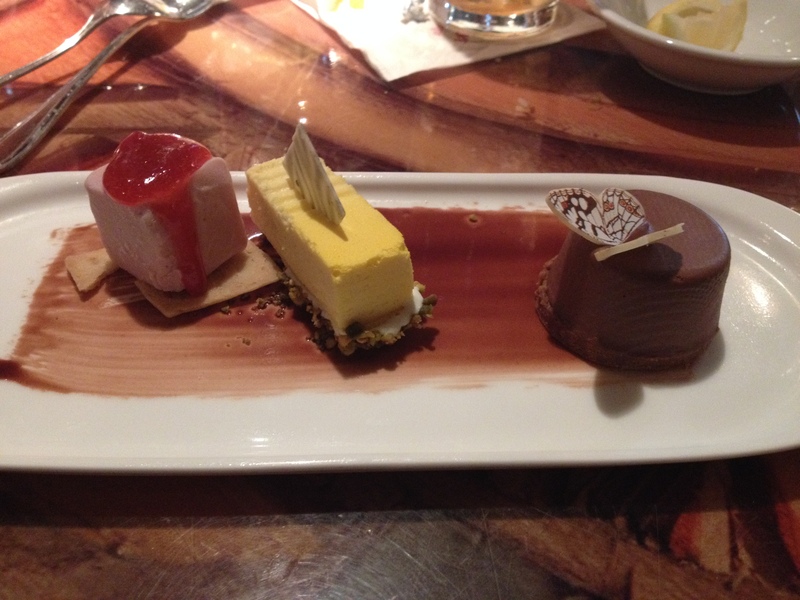 I took a few Disney food photos, as only a true foodie would, and share them with you below. 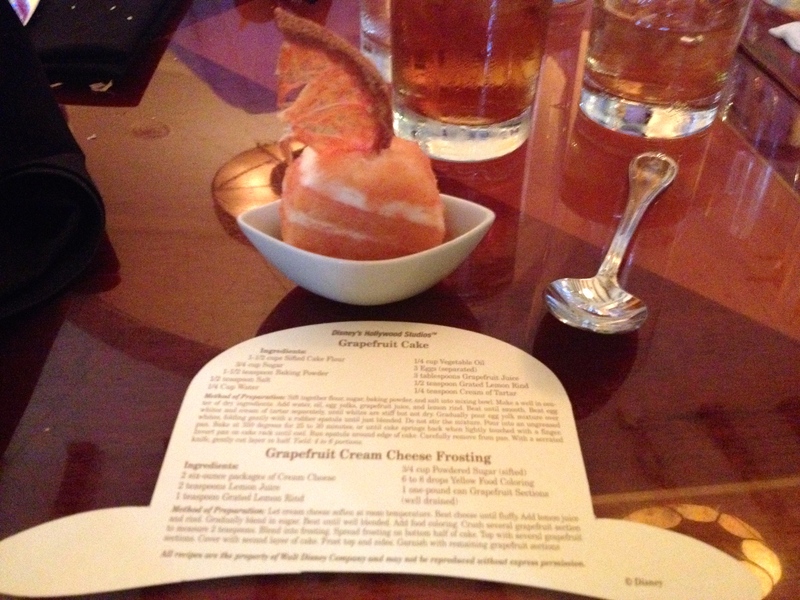 If you wish to read more about the restaurant featured, click on the link below each photo. 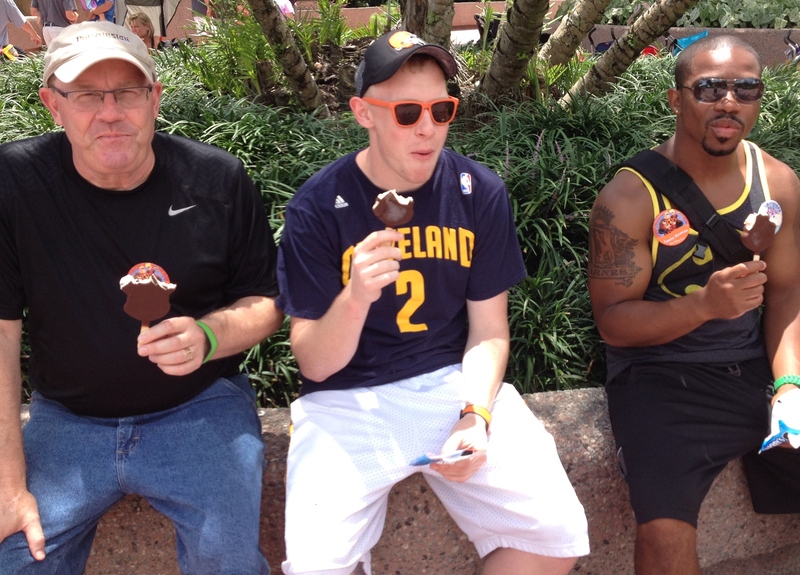 Dale, Chandler, and Eric chompin’ on Mickey Bars on a hot day at Epcot. 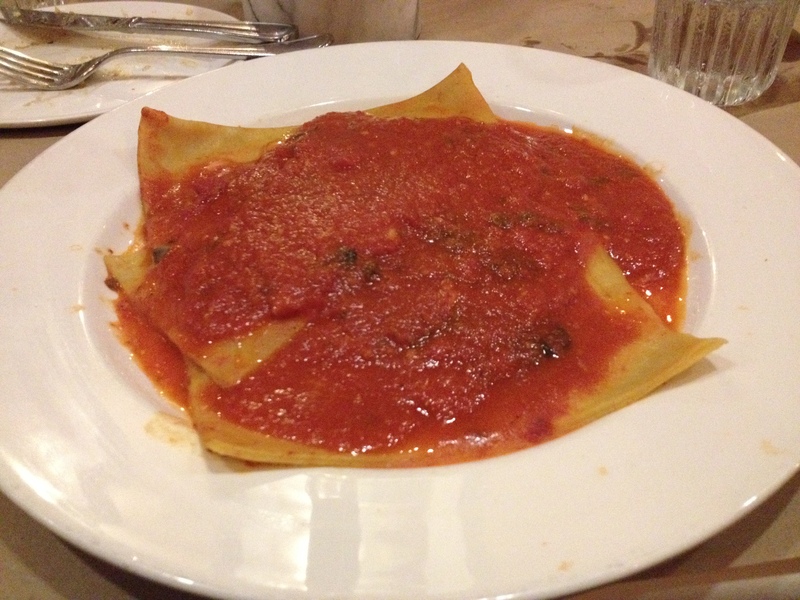 This delicious gigantic pasta was filled with spinach and ricotta. Yum! 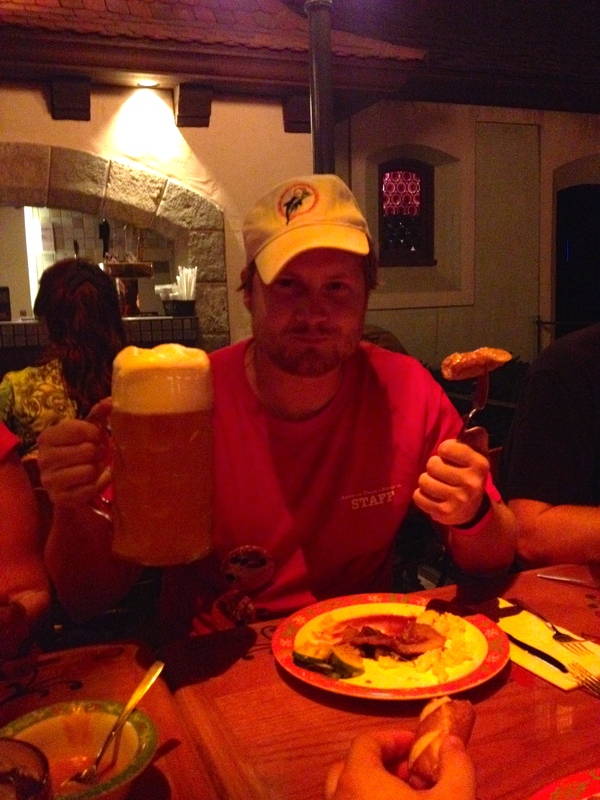 I recommend the weiner schnitzel! When at Disney World, a Pineapple Dole Whip is a must. 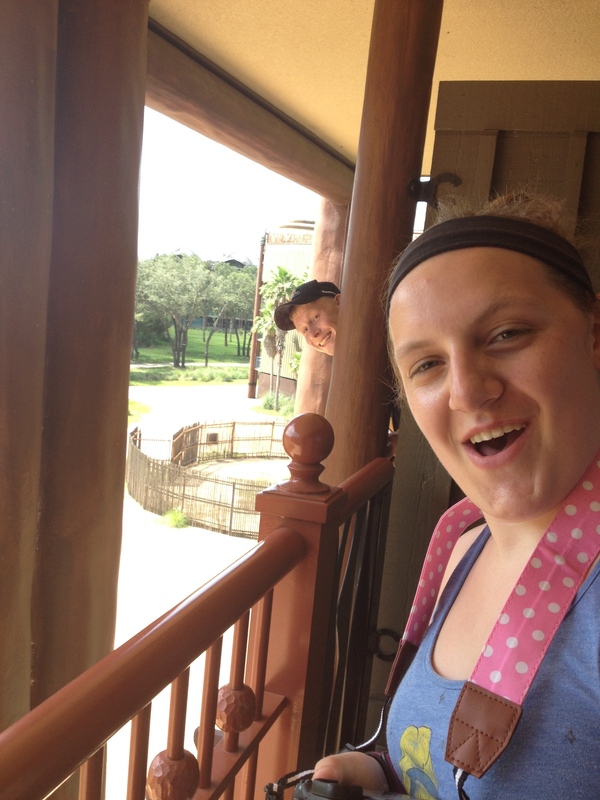 This photo was taken of Martese at WDW in 2012. 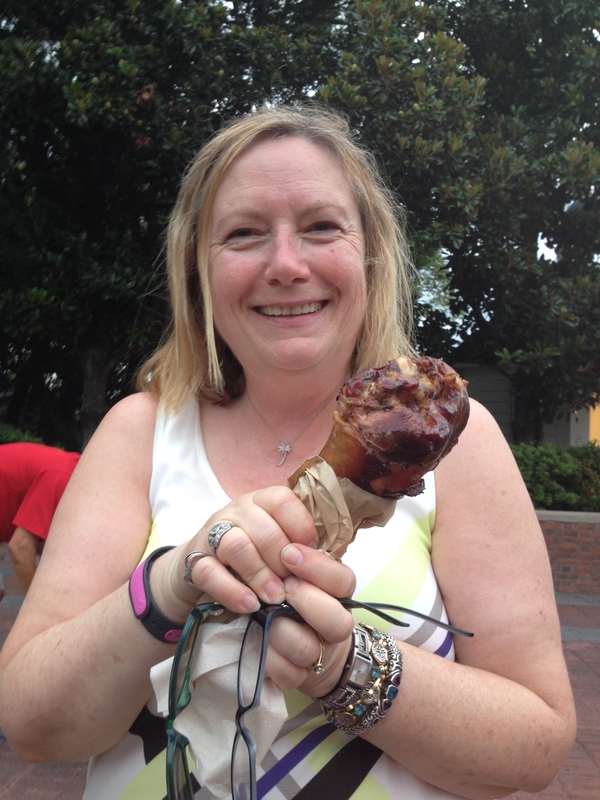 The infamous, and oh so wonderful, Walt Disney World Turkey Leg! My husband, son, and I made a special trek to the Columbia Harbour House, quick service restaurant, in the Magic Kingdom, for a lobster roll. Upon arriving, we found that lobster rolls were absent from the menu. 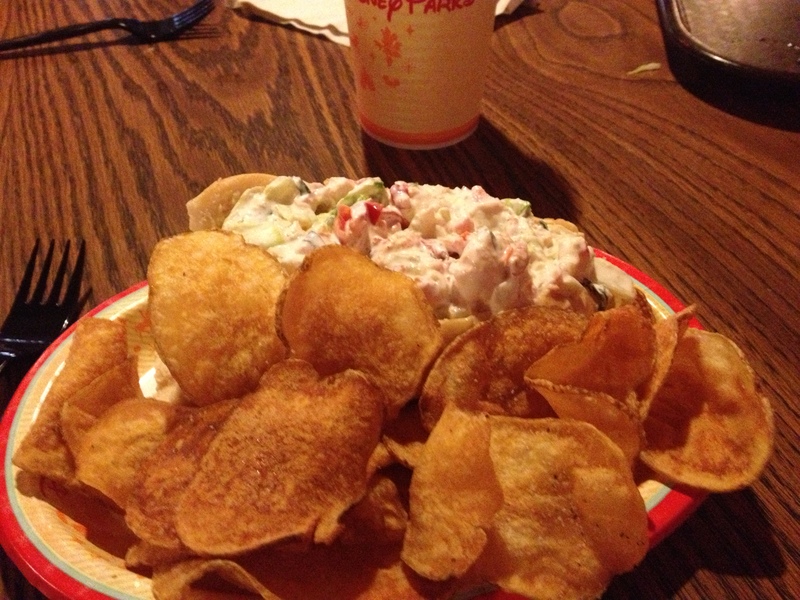 We asked an employee about them, and they made three lobster rolls for us upon request! SCORE! They were very good and the kettle chips were yummy, as well! 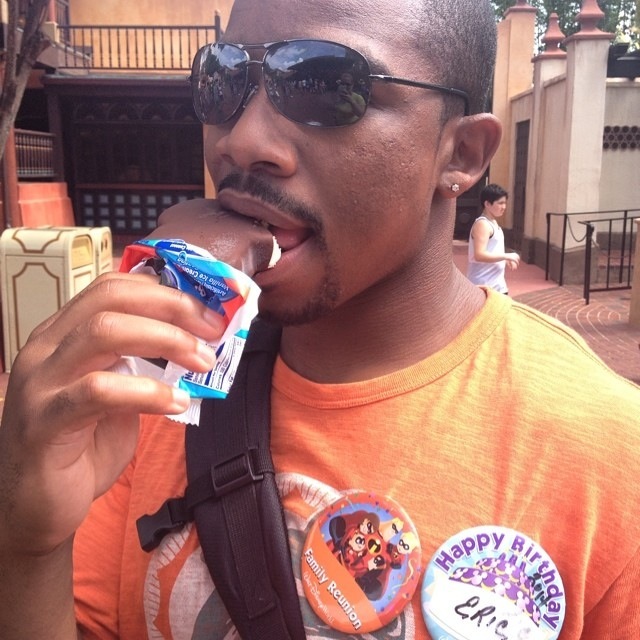 Eric enjoying another Mickey Bar, in Hollywood Studios, on his birthday! 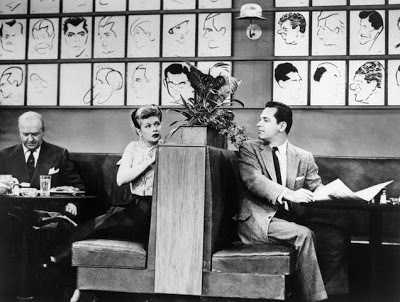 To watch the “I Love Lucy” episode “L.A. at Last!”, please click on the link below. To read my previous post from July 2013, Walt Disney World Really Cooks!, which includes a WDW recipe for Fettuccine Alfredo; please click on the link below. I make it often at my house. 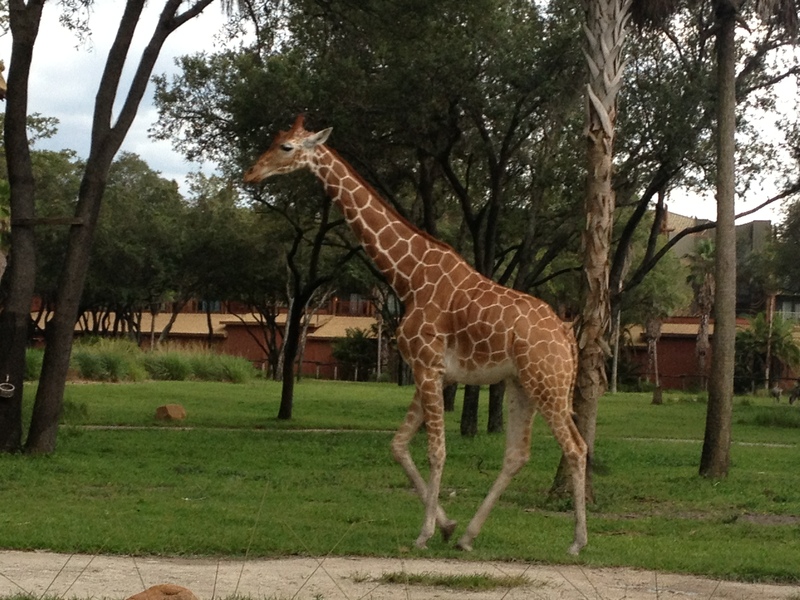 Restaurantosaurus in the Animal Kingdom! 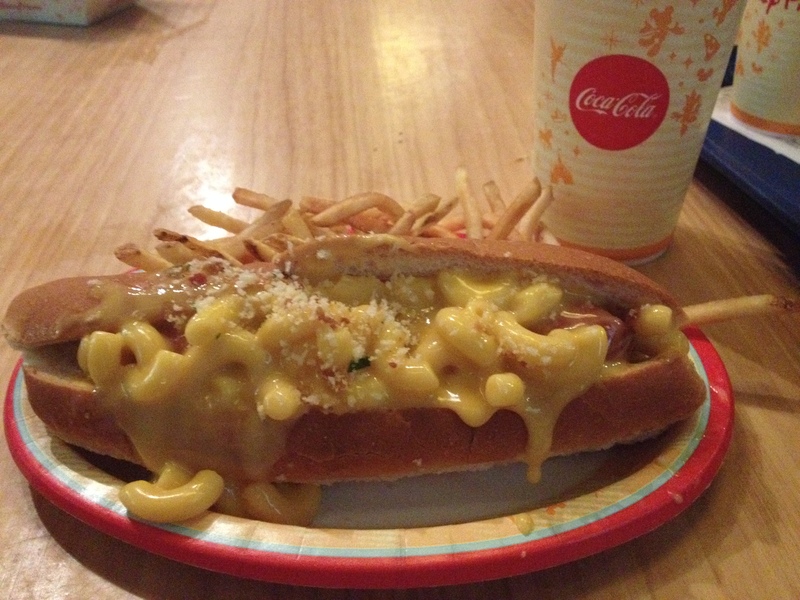 It is a Macaroni & Cheese Hot Dog topped with bacon bits. It was ok, but I think that I can upgrade this at home to gourmet status by using higher quality ingredients. The star of the Sanaa meal, for me, was their signature banana cheesecake with pistachio crust (center) and, of course, the sight of African animals roaming just outside the window! Gotta have Mickey Waffles while at Walt Disney World! YUM! 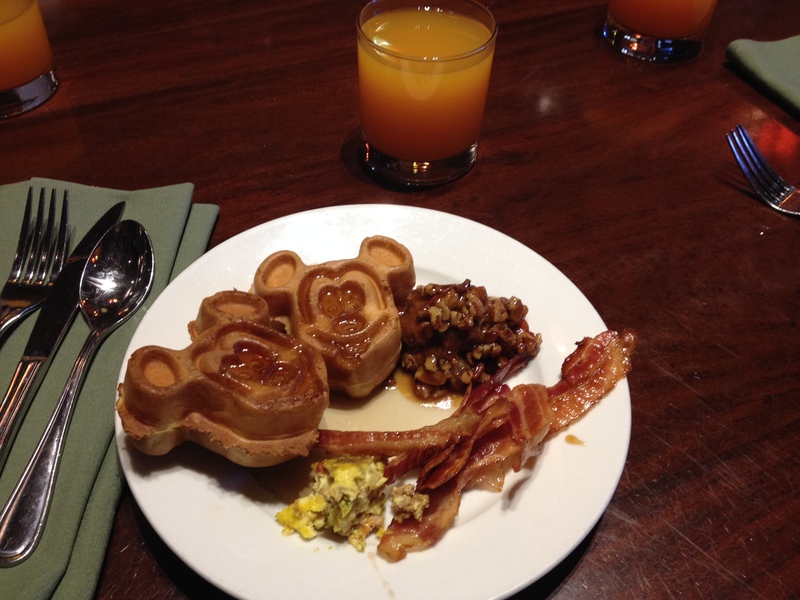 These were served at the Animal Kingdom Lodge’s Boma’s breakfast buffet with tasty Jamba Juice. The baked bread pudding with praline sauce (to the right of the Mickey waffles) was delicious, too! Bacon was the perfect side. 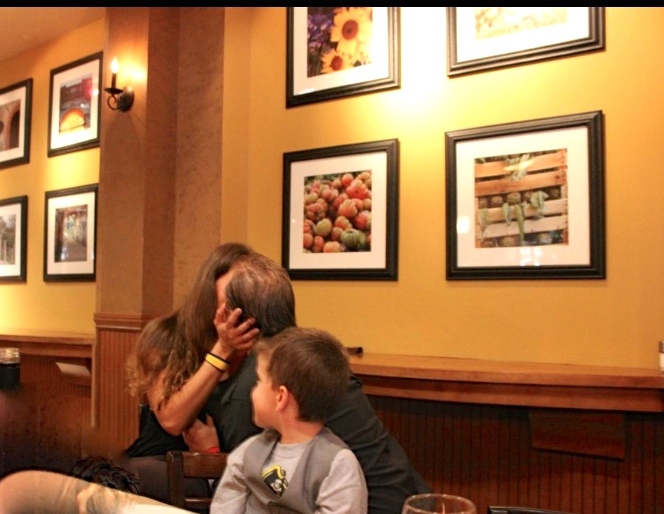 Dale and I cherish our time together with our family. 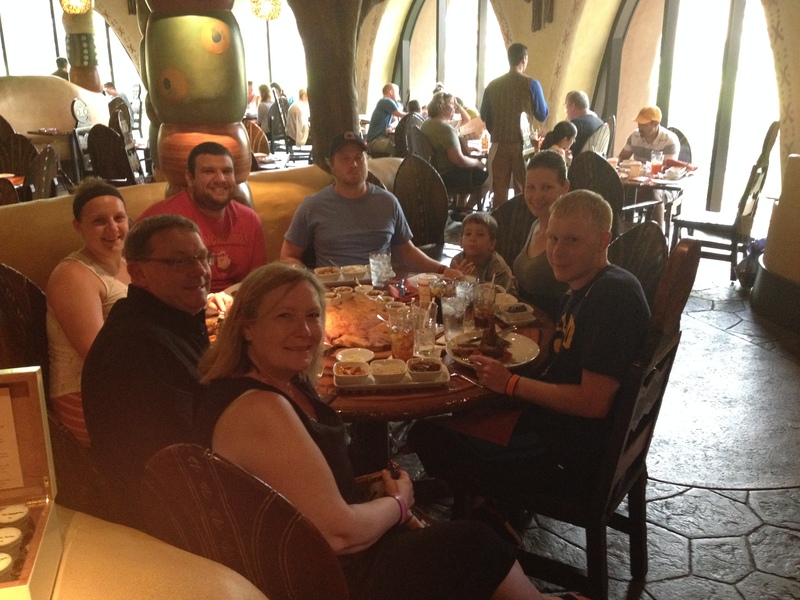 Disney afforded us the opportunity; to not only enjoy each other’s company throughout the week, but to witness the marriage proposal of Trevor to Tanya! How special to be present for that wonderful moment. 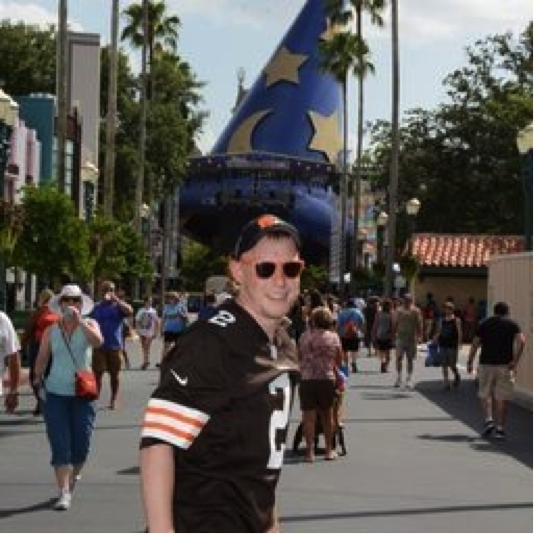 We also joined Eric in the celebration of his birthday that week, enjoying the day at Hollywood Studios. 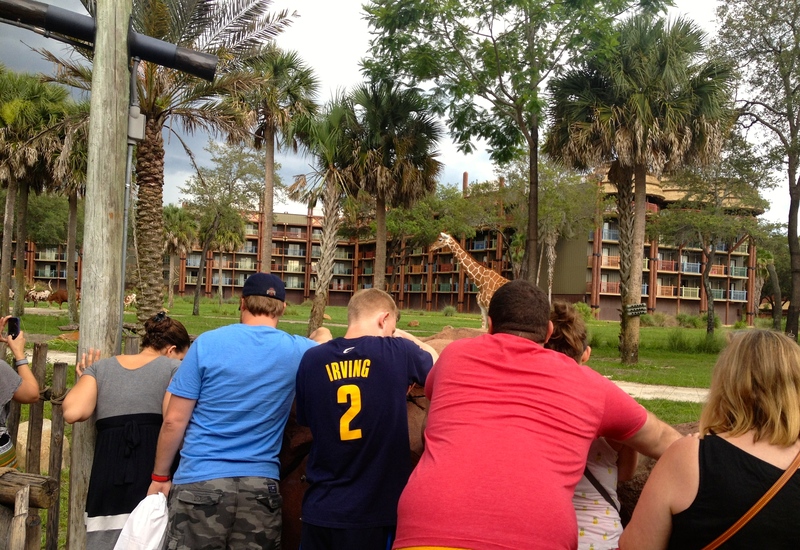 On our final WDW night, we all delighted in staying at the Animal Kingdom Lodge, something new for all of us. 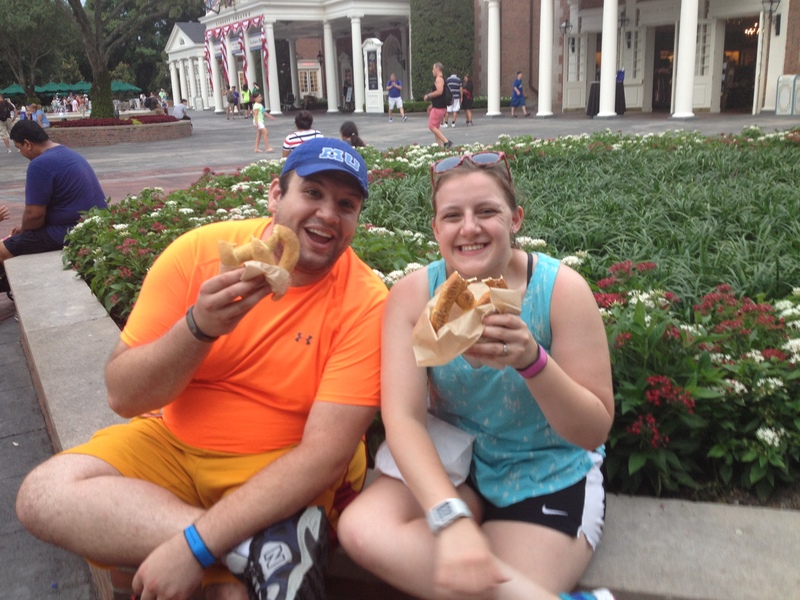 Sharing time together with our kiddies, and playing at Walt Disney World, equals a wonderful week! Tanya says “YES!”, as Ajaye looks on. 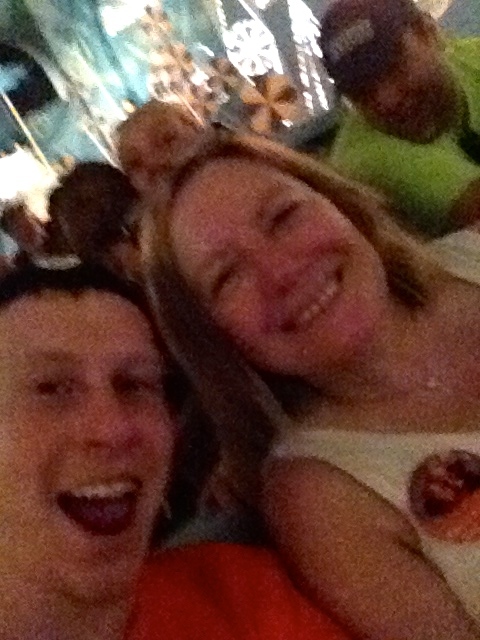 Chandler and I share a silly moment on the Magic Kingdom ride “It’s a Small World” with an equally silly Martese and Mike in the background. (Sorry for the poor quality due to low lighting.) I first encountered this ride as a six year old at the 1964 World’s Fair. (Now you can calculate my age. :o)) I still remember it! 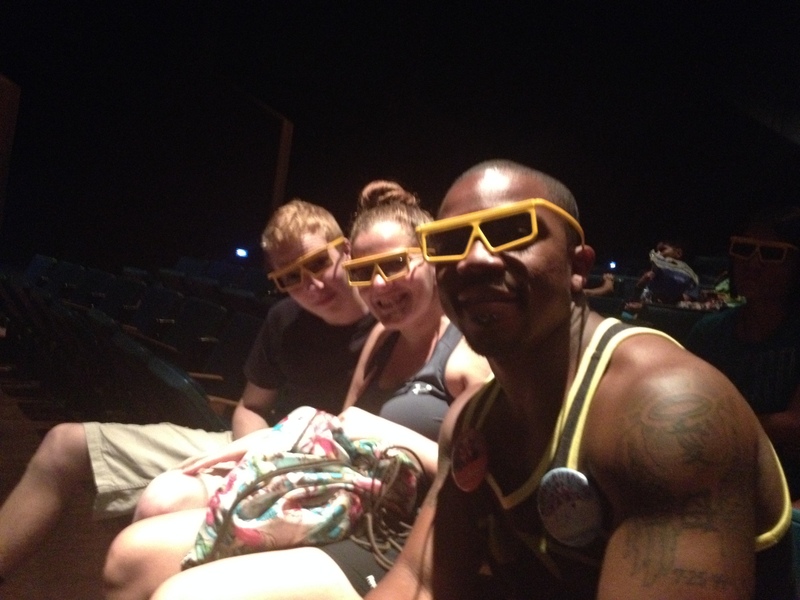 Brandy’s brother, Brandy, and Eric are eyeglass ready for the Michael Jackson mini-feature film “Captain EO”. When Trevor was a little tyke, he was very afraid of this one! 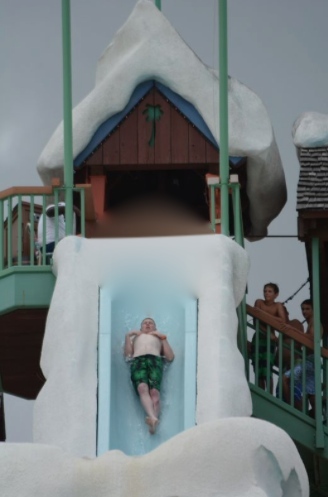 Needless to say, I was only a spectator for this one! 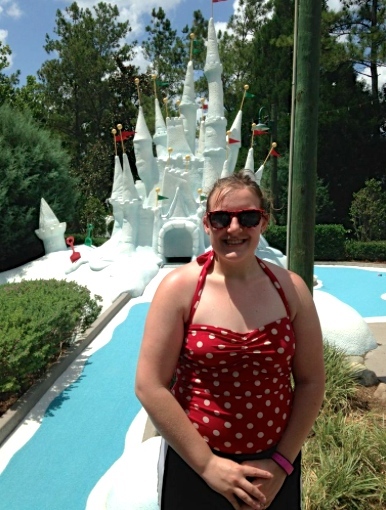 After a day at Blizzard Beach, Martese, Mike, Chandler, Dale, and I hit the Winter/Summerland Miniature Golf Course next door, complete with Christmas Carols playing overhead. Most fun putt putt golf course, EVER! Brandy and Chandler sing “Happy Birthday” to Eric at The Brown Derby. 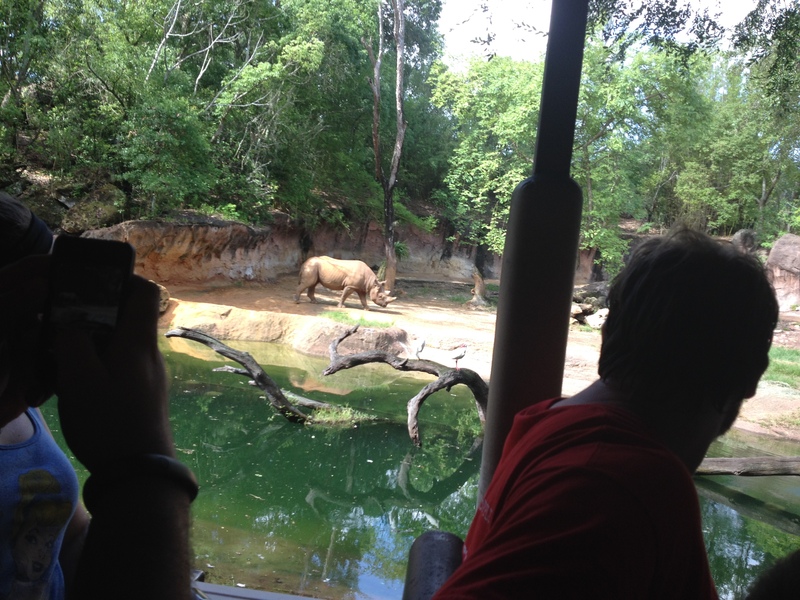 Rhinos and Elephants and Giraffes, oh my! 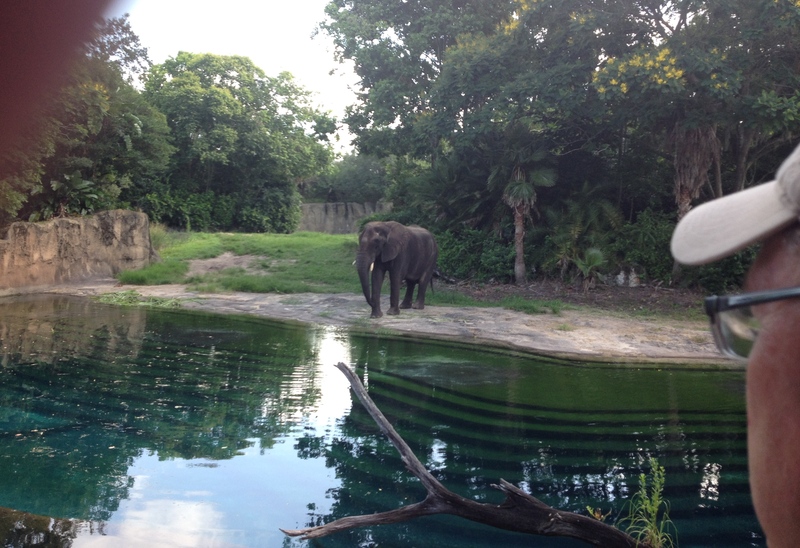 Scenes from our Safari ride at Animal Kingdom. 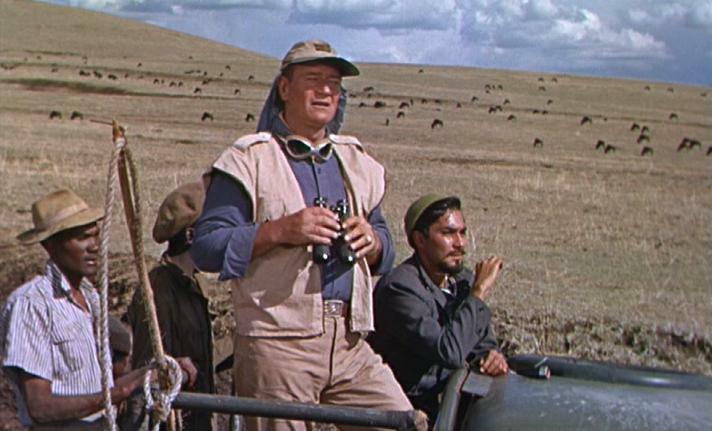 For information on the movie Hatari!, such as, most of the stunts were done by the actors on this film, click on the link below. 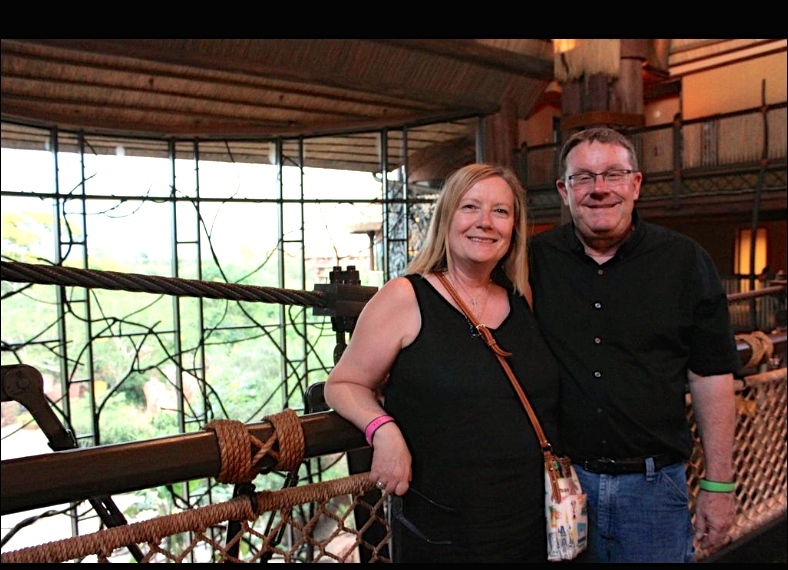 Having rented a very nice, comfortably spacious house 15 miles from Disney World for the other nights, we decided to splurge on the final night, staying somewhere new to all of us. 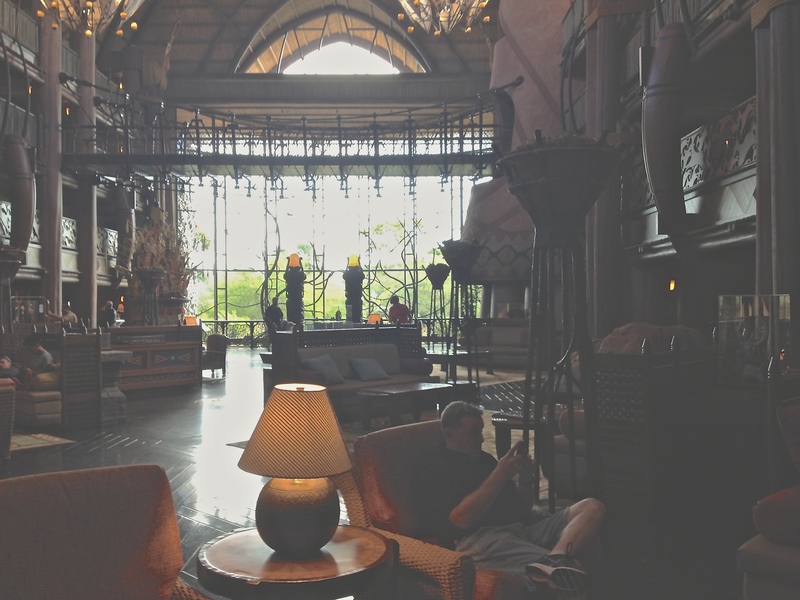 For our final night’s lodging, we reserved (thanks to Martese’s Disney travel agent expertise) a couple of rooms at Walt Disney World’s Animal Kingdom Lodge. 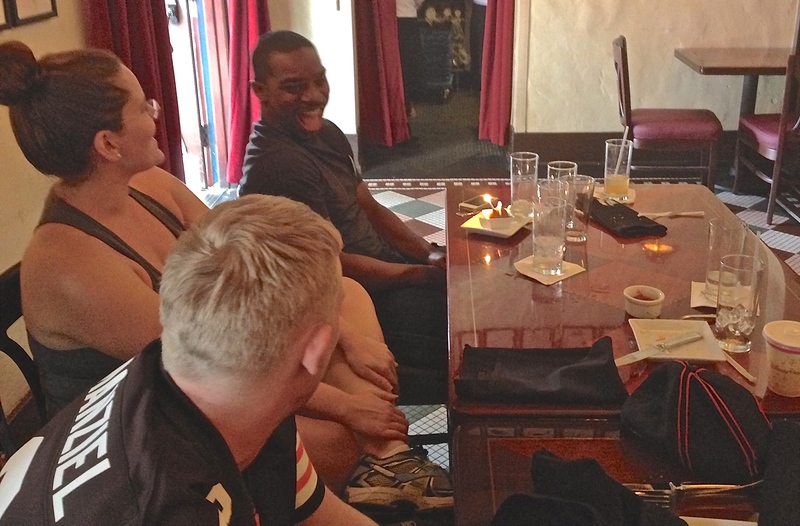 (Eric and Brandy’s jobs dictated that they go back home, the day before.) 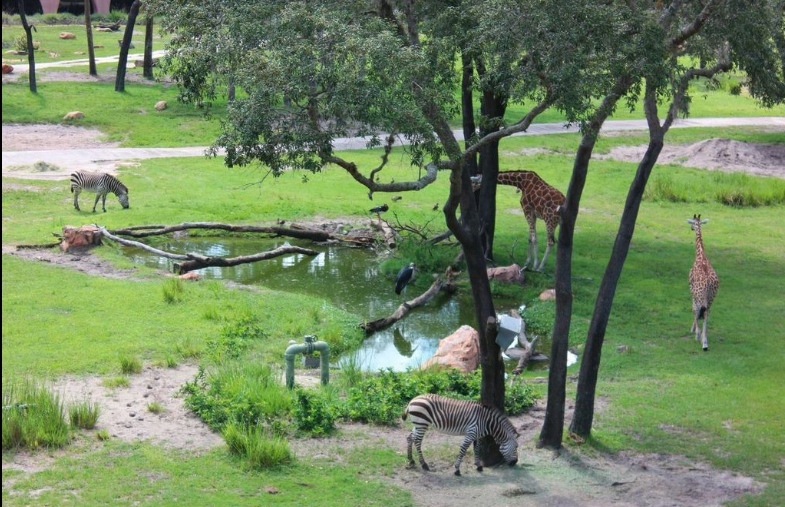 We opted for hotel rooms overlooking the savannah. 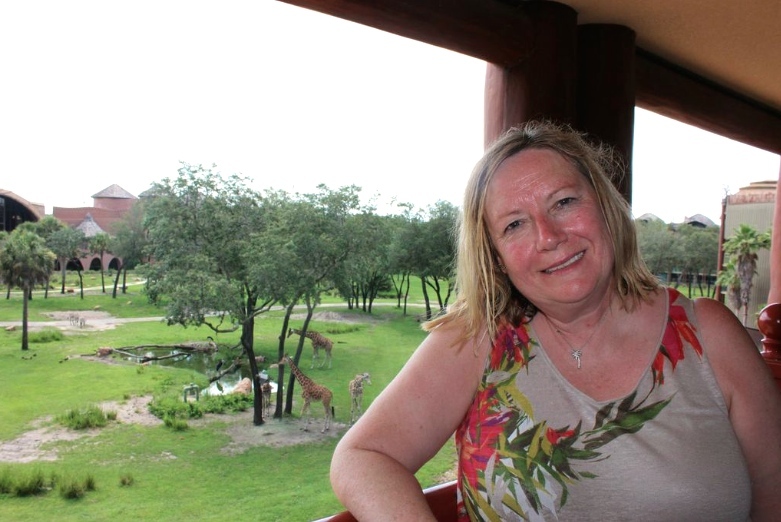 I can not overstate the delight that we all experienced upon walking out on our balcony to watch giraffes (my favorite), zebras, warthogs, and other African wildlife grazing a mere three floors below us! It was wonderful! 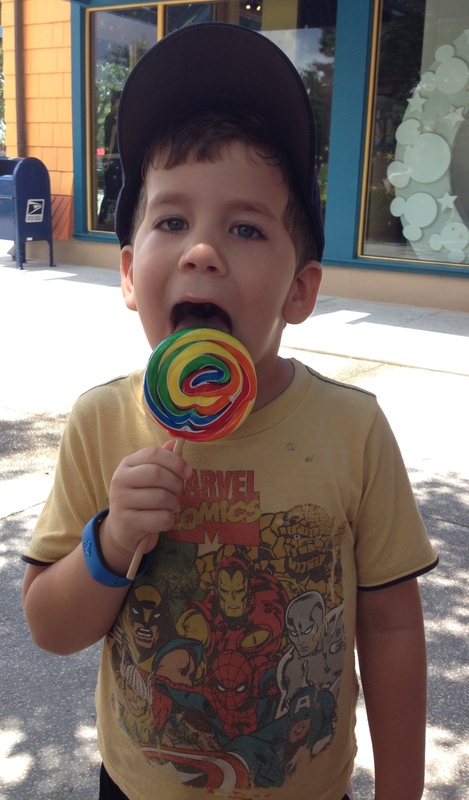 I just HAD to include this precious photo taken from our July 2012 trip to WDW. 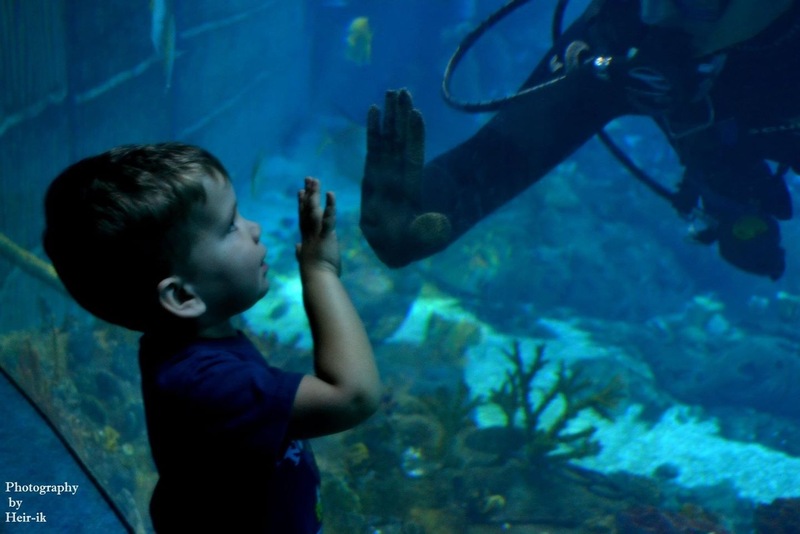 Eric captured this magical moment, at the Epcot aquarium, as a park scuba diver came up to greet a mesmerized Ajaye. 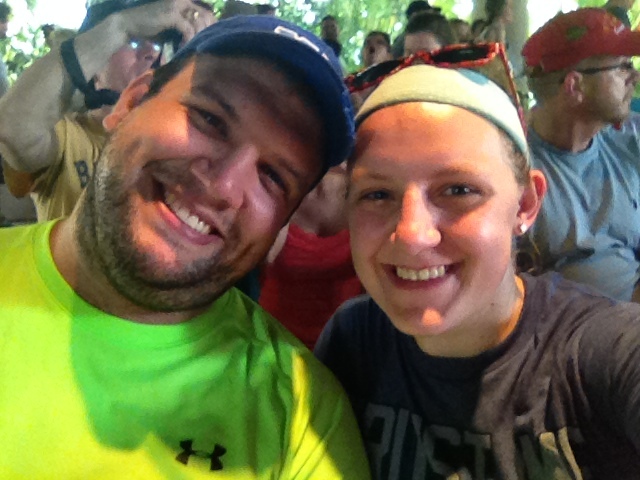 I attempt to post my blog bi-monthly. I will talk to you again around July 29. You inspire me to continue this endeavor. I truly appreciate your loyalty and encouragement! I invite you to sign up to get “I’m Annette” via email. To receive “I’m Annette” via email, FREE, yes FREE, immediately upon posting, sign up on the right-hand side of this page. Did I mention that this service is FREE? To read my previous Disney World related post from July 2013, Walt Disney World Really Cooks!, which includes a WDW recipe for Fettuccine Alfredo; please click on the link below. 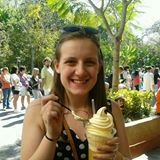 Our Daughter, Martese Ehm, is a Magic Maker® for Off to Neverland Travel, an Authorized Disney Vacation Planner for any of the Disney Destinations, and other vacation locations. Martese’s vacation planning services are FREE! 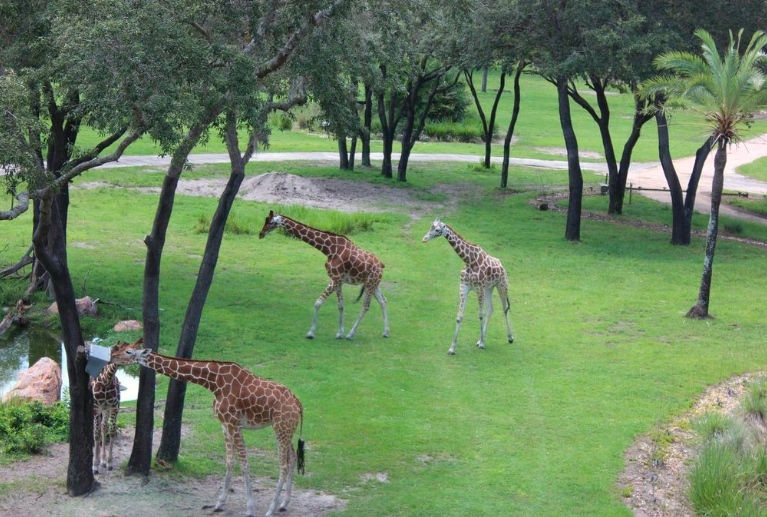 This entry was posted in Uncategorized and tagged african safari, african safari ride, animal kingdom, animal kingdom lodge, Boma, buzz lightyear space ranger spin, Captain EO, Cinderella's Castle, cobb salad recipe, columbia harbour house, Cream Cheese filled pretzel, Disney Travel Agent, Downtown Disney, engagement, Epcot, Epcot aquarium, fettuccine alfredo, Full House, grapefruit cake recipe, Hatari!, hollywood studios, I Love Lucy, Indiana Jones, Indiana Jones Epic Stunt Spectacular, Ingrid Bergman grandchildren, It's a small world, John Wayne, L.A. at Last !, lobster roll, macaroni and cheese hot dog, magic kingdom, Magic Maker, Mickey Bars, Mickey Ice Cream Bars, Mickey waffles, Off to Neverland Travel, Pineapple Dole Whip, Porobello Restaurant, Proposal, Restaurantosaurus, Sanna Restaurant, Sci-Fi Cafe, shirley temple drink, Summit Plummet, The Biergarten, The Brown Derby, The Great Movie Ride, turkey leg, Walt Disney World, Walt Disney World food, william holden, Winter/Summerland Miniature Golf, Wizard of Oz. Bookmark the permalink. 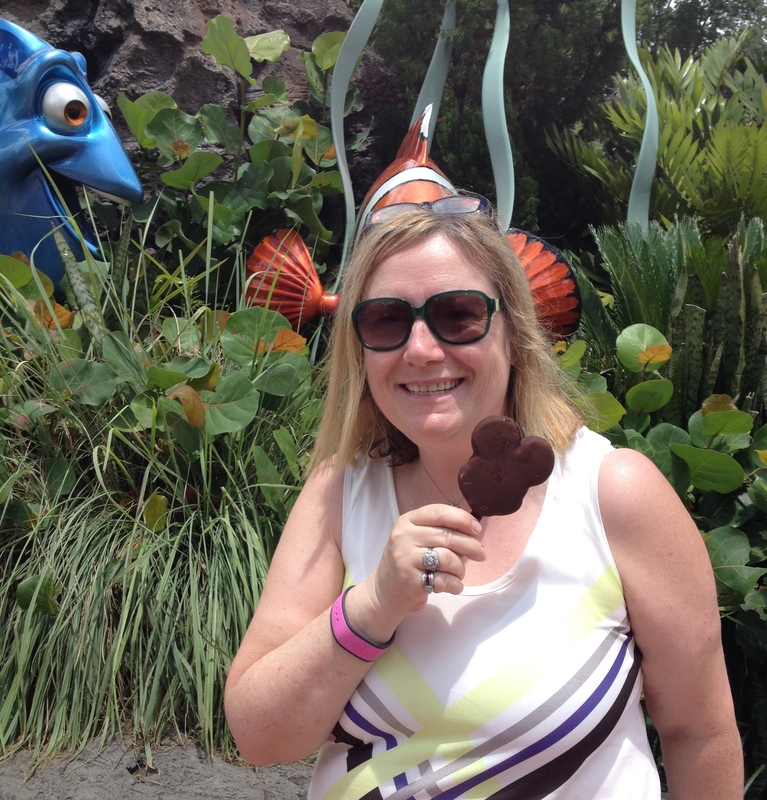 14 Responses to Annette’s Big Family Vacation Scrapbook: from the Happiest Place in the World, Walt Disney World! 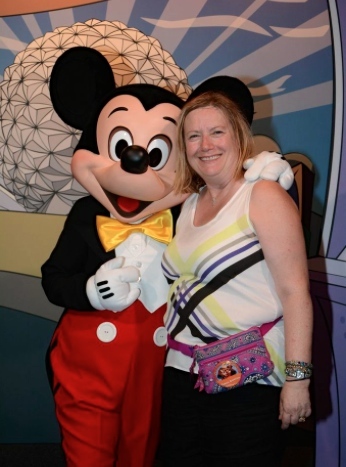 Annette, Great job of blogging your Disney adventure. 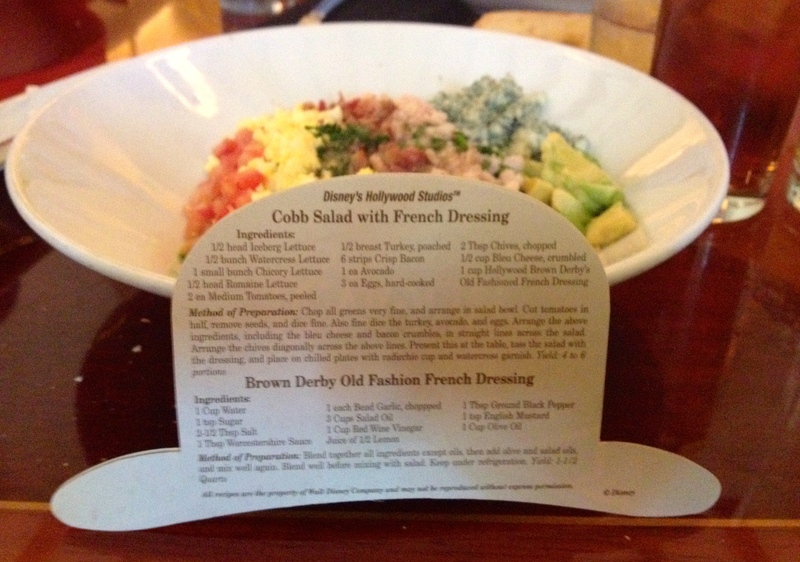 I printed out the Cobb Salad recipe and enjoyed the photos! 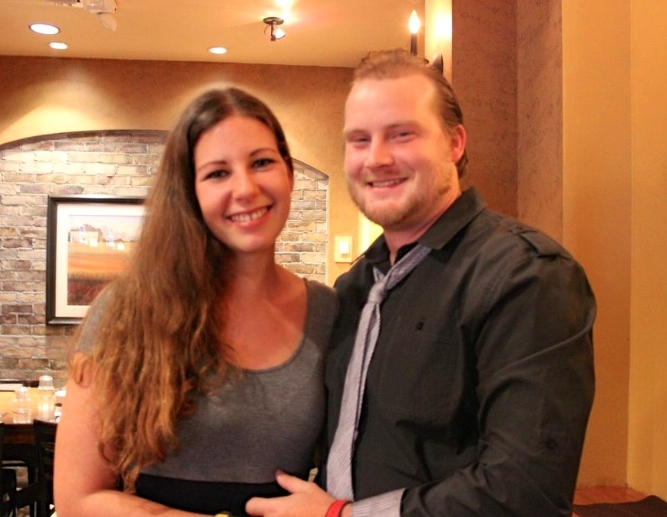 Congrats to Tanya and Trevor! 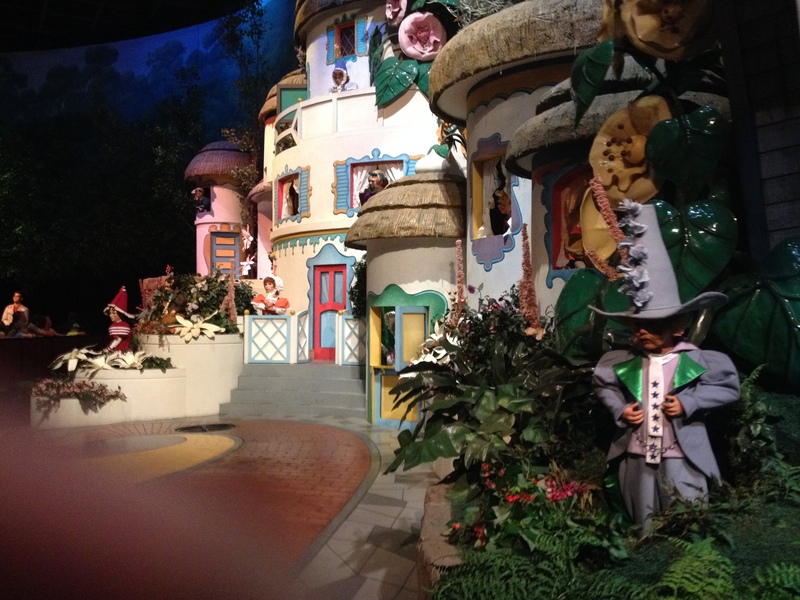 I also saw “It’s a Small World” at the NY World’s Fair when I was in seventh grade…went there with a friend and her family. It is a small world, after all! I wonder if you and I were there at the same time????? What fun!! 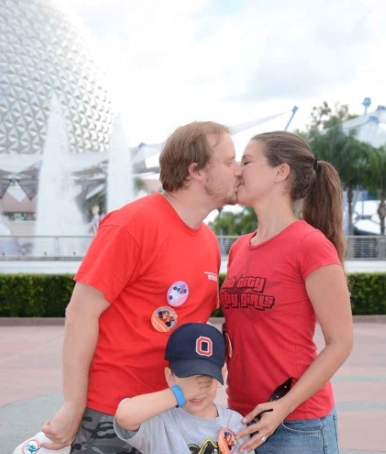 Sounds like you guys had quite a momentous family vacation!!! Love all the details. 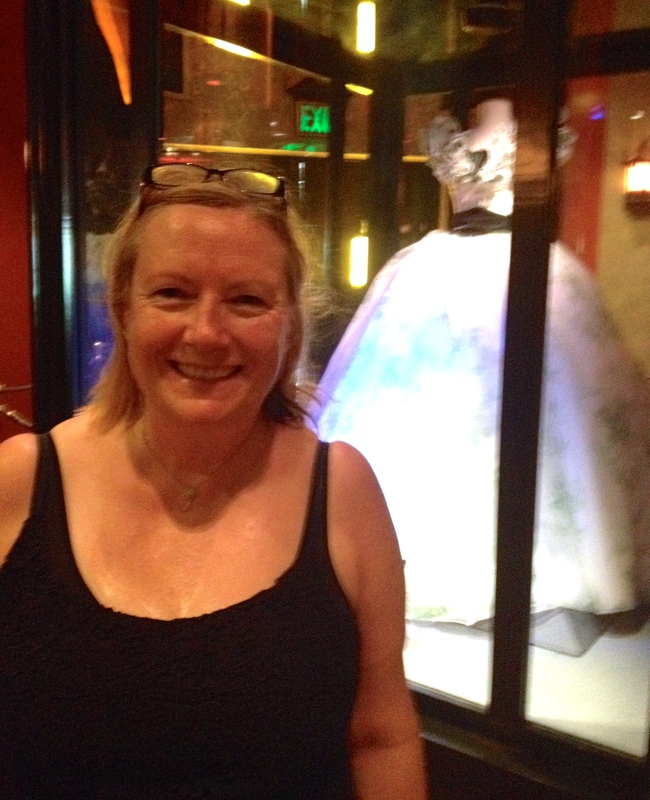 Pingback: Washington DC, Gettysburg, and Points In-between | I'm Annette!